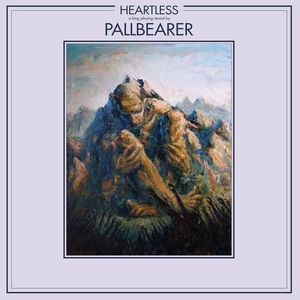 Pallbearer are the band that got me listening to modern doom. Their 2014 masterpiece Foundations of Burden has seen heavy rotation in my playlist since it came out, and topped many a pundit’s Best Of list for that year. Since then I’ve had a keen ear to the ground, attempting to suss out more great doom metal records – last year’s Darkher album topped my list – and while there’s been no shortage of great releases, we’ve all been waiting for the next Pallbearer effort. And here it is, their third album, Heartless. “Cruel Road” is pure heavy metal, shifting to almost a gallop once the verse kicks in. “Lie of Survival” is slow, airy, and beautiful, opening with a poignant solo. The seven songs on Heartless successfully merge doom with traditional metal, ’70s prog, and even artier, more atmospheric offerings such as Anathema, all while making it their own style. While there is no filler on Heartless, the bookend tracks are definitely the standouts. Opener “I Saw the End” fades into a lumbering intro before a melodic riff takes over. The song is an appropriately doomy beginning to the album until the halfway point, when the pace picks up and soaring, intricately arranged vocals lead us into an up-tempo guitar solo. Album closer “A Plea for Understanding” is an epic, clocking in at nearly thirteen minutes, Pink Floydian as it begins with ambient guitar and keyboard work before shifting into a melancholic dirge fitting with the track name. Brett Campbell delivers his most impassioned vocal performance to date: “Anger, fear, and regret keep the darkness at hand, but these feelings are real, all I ask won’t you please understand?” he laments. It is heartwrenchingly poignant. Heartless is self-produced, which is a tough task for a band to pull off – can they get the right mix, the right frequencies into the correct instruments, without exhausting the listener? And more importantly, can they coax their top effort from themselves, putting only their best on tape? The time Pallbearer spent with Billy Anderson producing Foundations of Burden has paid off, as the band has hit every sweet spot. Guitar tones are fantastic throughout, the drum sounds are clean and organic, bass rumbles in a satisfyingly ominous manner, and the overall mix of instruments is dead on thanks to Joe Barresi, who has worked with Tool and QotSA, among others. At times Campbell’s vocals can be a touch high in the mix, but because his singing keeps improving from record to record this doesn’t pose an issue.